Traditionally these cookies have always been known as Gram’s Butter Balls in my childhood memories. And they were fabulous. 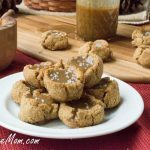 They were so easy to make with just 4 ingredients of flour, butter, pecans and sugar. I would often be preparing them with her as a child and loved every minute of the cloud of confectioners sugar all over me. Everyone looked so forward to them every holiday. Sadly when my grandmother passed, my mom tried to carry on the tradition. She still makes them but doesn’t have the time to make the dozens and dozens my grandmother would make for all our family and friends. That’s where I come in! My gluten free recipe for my Grandmother’s Butter Balls are in my cookbook. And they are good, but I have so many friends and family who need to be dairy free for health reasons and allergies. I’ve use Ghee which is a type of clarified butter and has very minimal amounts of milk solids in it, something like 99% free of milk solids. So if you’re dairy free and haven’t yet tried ghee, I would totally recommend it! I made these about 3 times before I got just the right texture and taste. The first time I made them my oldest child, the picky teen, asked if he could try one. I never mentioned the name of them or what was in them. He said, “YUM, these taste like Gram’s butter balls”! 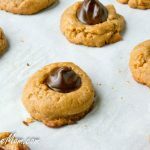 All 3 of my kids and picky hubby too loved these cookies each time I made them. Even my MOTHER said, these taste like GRAM’S!!! I was so honored! My grandmother, I think, would have loved my healthier version of her recipe or at least I would hope she’s proud of me for trying to carry on her cookie tradition. Baker’s Tip: Freeze them for 20-30 minutes before baking, helps keep them from spreading and flattening. I hope you enjoy these snowball cookies as much as my family did! Here are some other cookies you might love for the season! Recipe first posted in November of 2016 and updated Dec.2017 with new photos and video. Place all ingredients into food processor and process until batter forms a ball. Pulse if needed. Taste batter, adjust sweetener if needed. Line a baking sheet with silpat or parchment. Use a cookie scoop and make 24 mounds. Roll each mound in the palm of your hand. Place in oven for 15 minutes or until golden around edges. Once able to handle roll each in some confectioners sweetener. That’s so nice that you help your mother with the cooking making! I’d sure love a few of these. Erythritol is corn based which isn’t technically Paleo. Sounds like a lovely recipe besides that. Brenda, Your site and recipes are so amazing! Thank you, thank you, thank you! Would the recipe be the same if you wanted to just substitute real butter? Yep real butter will work just the same. Since going LCHF, I have felt left out of the Holiday cookie craze. This recipe has changed all that! Can’t wait to try them. Thank you so much for all of your recipes and tips. Have a great Thanksgiving! Can I substitute all the sweeteners you used with just a Splenda naturals sugar ? If so how much would I need? Sure, I’d say use 1 cup. 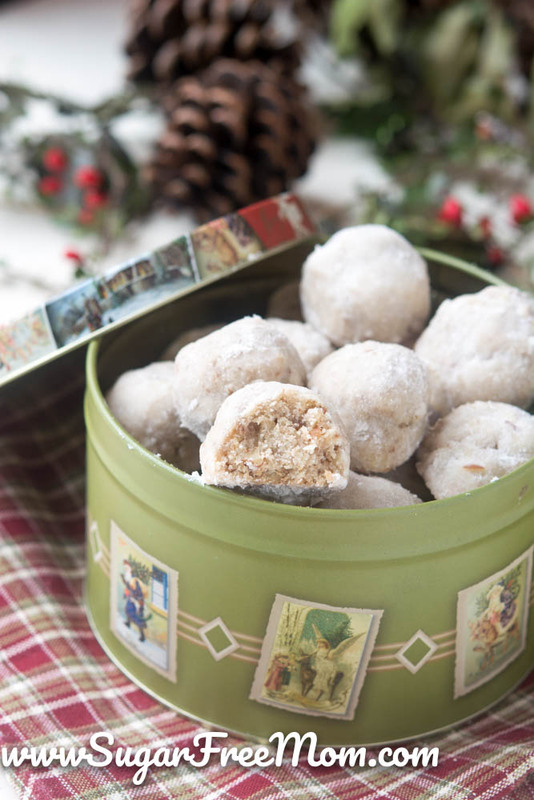 I love snowball cookies – your version looks spot on! That’s so nice that you’re carrying on the tradition! I have to try these! 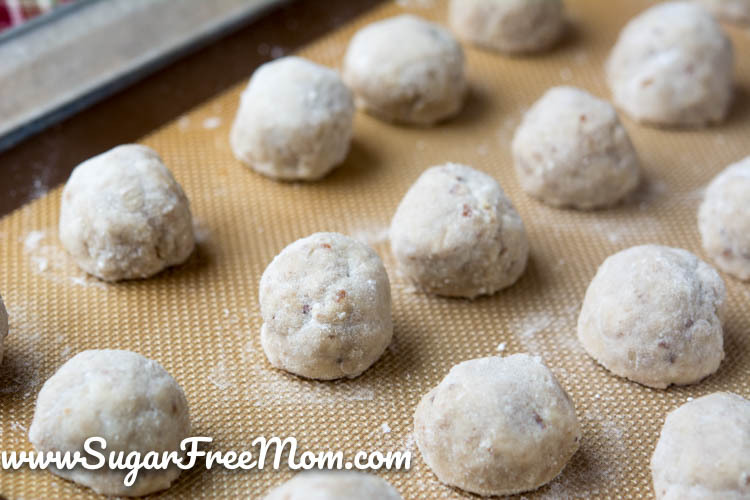 These are some of my favorite holiday cookies – love that they are sugar-free! Brenda, these cookies look amazing. I love the tip about freezing them, excellent! 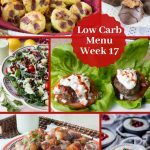 I also love the the low carb aspect. Just in time for the holidays. , thank you very much! Mmmm, these are pretty darn close to my hubby’s favorite shortbread. They look fantastic! 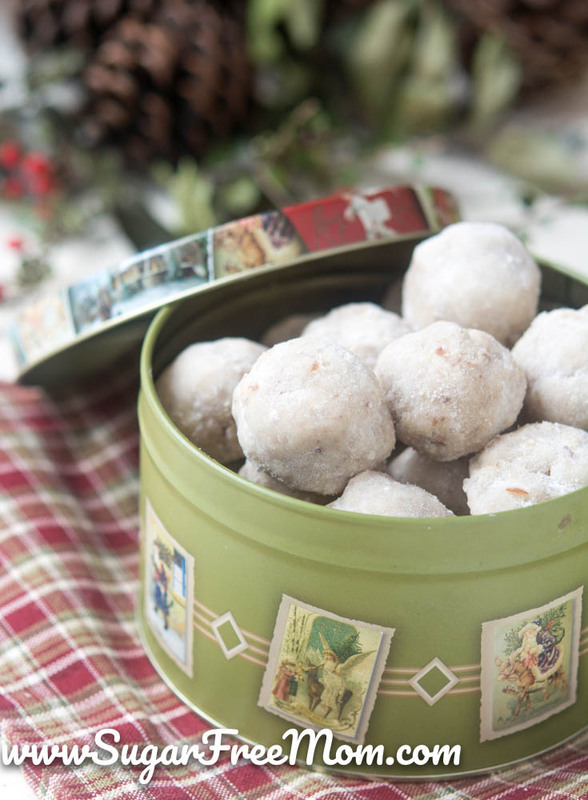 I adore snowball cookies and I can’t wait to try your version! This is a beautiful cookie to add to my CHRISTmas Eve family dinner. I may just whip some up for Thanksgiving, too! Thank you, Brenda! What perfect Christmas cookies and perfect memories! I love this! Oooooo, I love that pic with the bite taken. They look like the perfect consistency/texture… and I just want to finish that cookie off! I made these last night, OMG they are FANTASTIC. I have always loved these kinds of cookies but being diabetic I couldn’t have them, NOW I can. Thank u.
P.S. I made mine with real butter. So good. YUM! So happy you loved them! Could you do them in a mini muffin cup then you wouldn’t have to worry about spreading? you could try that, I thought they would take on the shape of the pan and be flat at the bottom so I chose not to try it. Diabetic son-in-law. Now that he can’t indulge in my regular cookies. My FIL is a diabetic, I’m adding this to my list so he can enjoy some holiday cookies! These were a favorite of mine growing up. 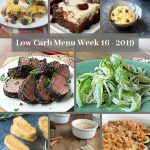 Since I follow a low carb diet I am glad I found your low carb recipe version. Thank you! Just wondering if the recipe can be done with no mixer or food processor? I found out I’m getting one for Christmas but that doesn’t help me in my quest to make these the day before Christmas!! By hand may be difficult but I think as long as you have finely chopped nuts you can do it, may take some arm strength to get everything well combined. Please let me know if you do try it by hand. what is a good substitute for liquid Stevia? 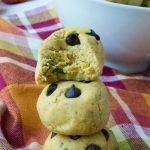 Love this type of cookie and this low-carb version sounds great! Help!!! I don’t have a food processor…can I use a mixer instead? You can but you really need the pecans to be chopped well. Let me know how it turns out for you. I haven’t made this version yet, but I definitely plan to because they look so much like my usual Russian Tea Cakes. Just have to buy the Swerve confectioners Sweetener and the Vanilla Liquid Stevia. 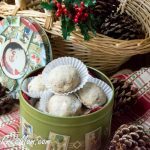 I’ve been making the traditional Russian Tea Cakes for many years and I have always used a regular old hand mixer, but I use my old Pampered Chef hand crank cheese grater to finely grind up the pecans. It makes it a lot easier to mix in the nuts. My family and I like the cookies with the pecans finely ground, but they would also be good with only half of the nuts ground and the other half finely chopped, if you prefer to have some slightly bigger pieces. I wanted to let you know this is the first time I am leaving a comment. These were so fantastic that I just had to let you know and thank you for this great recipe. 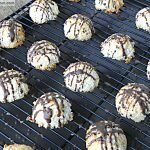 I have been following a ketogenic diet, and had compiled a list of keto-friendly holiday cookie recipes. I tagged these to include at our our annual family cookie baking weekend. I made these there and everyone was crazy about them. And, everyone raving about them does not follow a low carb or sugar free diet so this is quite the compliment – all their baking was with flour, sugar, etc while I had my almond flour, Swerve Sweetener, etc. And, they liked these the best!!! But, to be totally honest, I used butter as I wanted to use all keto-friendly ingredients. These were so good that last night I made 6 batches of them to give out to my customers. Thanks again for the awesome recipe – everyone is now asking me for it and I have given them the link to it. I can’t wait to try this. Since becoming gf and sf I thought I’d have to give up my fave cookies!! Thank you! I don’t have vanilla creme stevia, I have Liquid stevia and vanilla, and thought? You can still use plain liquid stevia, same amount then use a bit more vanilla extract than I did. Taste and adjust. Any sugar free sweetener you prefer is fine. If I use butter, would I still need to freeze before baking to keep shape? You may not, but it can’t hurt to at least refrigerate them for 20-30 minutes. These are so good Brenda! I was so glad to see this recipe since my Mom used to make these every Christmas (we call them ladyfingers and roll them into cylinders). I used butter since it’s what I had and I also used Sukrin instead of Swerve (Swerve has been giving me GI trouble). They are just like the ones my Mom made and I’m taking some to her on Christmas Eve (she is now in a memory unit and we’re having a little party for her). I’m so glad to be able to take her something she used to make and I can eat it too! I may take a break from dairy in the new year so next time I might try a coconut blend. Thanks so much for this recipe, it really means a lot to me. I’m so glad! These are a much loved cookie in my family as well! Where can I find sukrin and what is it made of? I think swerve has been giving me GI problems too. Oh my word! I made these Christmas eve and they are seriously awesome. I used butter, and I did put them in the freezer for the recommended time. My baking time took a little longer, but I love how they held their shape so beautifully. My only issue with these little bites of heaven is my lack of self control around them! When I put all of these ingredients into MyFitnessPal, making 24 servings, I get 106 calories, 10.6 g fat, 8.2 g carbs, 1.2 g fiber, 2 G protein. I highly recommend lchf people check this for themselves! Correction – I put in double the Swerve on the app. The carbs are 5, fiber is now 1. I feel better now, but still believe that is a significant difference for carb sensitive people like myself. Flavor is right on- texture is a bit different due to almond flour- but still a winner! I will be making these again using butter and will update the recipe. Is Earth Butter organic buttery spread keto friendly? & okay for Dairy-free? It’s definitely ok for a dairy free option. As far as keto I think many would say, butter is better for a keto diet. I just found your site today and stumbled on these cookies. 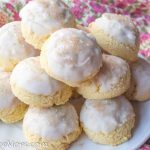 I’ve been making snowball cookies every year for the past 30 years, and my mother made them before that. They are a family favorite–my adult children request them every Christmas! This is my first year eating keto, and I was wondering how I was going to have the willpower to not eat them myself. You’ve saved the day with this recipe! Can’t wait to try it–and I’m hoping I’ll never go back to the original. After reading your family’s responses, I’m guessing my children won’t know the difference! Sound wonderful! Could you use coconut flour instead of almond? I️ am allergic to almonds. I wouldn’t use as much. Often you can’t swap almond for coconut in many recipes because coconut usually needs more liquids. Reduce the coconut flour to 1/2 cup, you won’t get as many but they won’t be super dry, r try using the cup of coconut flour but increase the butter to 2 sticks. This is all guessing as I’ve not tried it. so i bought the granular swerve instead of the powdered…if i whizz it in the food processor will turn into powder? You could try that, I think it would work fine. worked like a charm…what a tasty cookie!! Wow, these snowball cookies look great! Perfect for winter, lol. Can’t wait to try them myself, must be super delicious! I don’t care for stevia. Can I just add more Swerve and how much extra? Thanks. I would say at least 1/2 cup more Swerve. I made these today for my son who is Type I diabetic. I used spend and put in food processor to makeep powdered sugar. They turned out really good!!! Not sure why mine went completely flat. Any ideas? Did you freeze them prior to baking? Change any ingredients? I used regular swerve, had them out on the deck for 30 minutes and it is about 32 degrees here. I still don’t think they were cold enough to cold there shape. A freezer is like 0-20 degrees to keep things solid cold and the butter really needs that in order to hold it’s shape. I just wanted to let you know that these are actually not dairy free as written. If you have a milk allergy ghee is not an acceptable alternative to butter. Perhaps you should say it is light on dairy? Ghee is 99% free of milk solids and most who are sensitive to dairy can use Ghee without issue. Can I use coconut oil instead of butter/ghee? My grandmother always said Butter makes it Better, but sadly allergies prevent the use of dairy for us. Thank you so much! I froze mine for 30 minutes in the freezer in a glass dish and then transferred them to a cookie sheet for baking. the center ones maintained their round shape but the ones around the edges got pretty flat. Next time I’ll freeze them longer. I also thought it was a bit sweet as written. next time I’ll use less sweetener. Otherwise a great adaptation of a favorite recipe! Thanks for sharing it! I made these last night, and they are almost gone! My family loves them!! Wondering if measurement is the same if I replace swerve With a homemade version of icing sugar using arrowroot and coconut sugar?! I would think they would be fine, although Swerve isn’t has sweet as other sugar free sweeteners and definitely not as sweet as coconut sugar so you may need a bit more. Hi! I’m excited to make these for Christmas. Do you know if I could make them ahead of time and freeze them and then bake them later? I bake them ahead and have frozen them once cooled. I’ve not tried preparing them and not baking them but I think you could make them into balls and place them in an airtight container, probably best to place parchment between the layers so they don’t stick. Thaw the night before you want to bake them. Oh cool, thanks! I am also fine with preparing them all the way and then freezing them. Do you just remove 24 hrs ahead of time and thaw and then they’re ready to eat? Yes I’m pulling mine out of the freezer on Christmas Eve morning and I think they will be fine to enjoy even on Christmas Eve night. thank you so much for this recipe. They really taste amazing. My mom used to make “snowballs” every Christmas. I still have some go flat even though I freeze them (I use butter) but you know what they still taste great. I just made them again last night, froze for 30 minutes and baked and they stayed perfectly round. Was your butter completely melted when you added it or just soft? I used ghee and froze for 45 min. amd mine were flat also. I was wondering if my ghee should have been refrigerated before using? They do, however, taste awesome! I made these with ghee, froze for about 30min, however after baking these things just crumble to pieces. I’m at high elevation so not sure if I need more liquid so they don’t crumble? Thanks! Sounds like they were dry if they crumbled apart. They are however a fragile cookie, but should not crumble, you may have needed more ghee. I just took these out the oven, but realize I did not roll the mounds into balls between the palms of my hands after releasing the balls from the scoop. I guess I will have to sprinkle powdered sugar on instead of rolling them– since I did not make balls. 2nd time I added cocoa nibs and a little more almond flour and more butter. They came out good but lacked the firm texture of my first batch. Next time I’ll stick to the recipe. Thank you. I made these during the holidays,and they were so amazing I wanted more. Well I forgot to use confectionery sugar, so I am gonna bet they fall apart, or fall flat. We shall see. I’ll be using butter because I don’t have ghee at the moment. Do you need to let the butter cool down to room temperature first? Most recipes call for that. Yes butter that’s room temp is perfect. I’m beginning to think it really may depend on how soft the butter is when you begin. So if someone has melted their butter and i only softened my butter, there’s the difference right there. 30 minutes in the freezer will work for mine when the butter was just softened but if the butter was melted then 30 minutes in the freezer might not be enough time for it to stay in shape while baking. I’ve made this so many times and I’m not sure why some follow my recipe exactly and can have perfect results and others are not having the same success. I am on anti candida diet and only allowed stevia as sweetener. Can i replace the swerve with stevia? If you have a stevia product that measures cup for cup like sugar then swapping it for the Swerve would work fine. Holidays Schmomlidays! I can’t wait that long…. I’m making them in April cause these have always been one of my favorites and it’s been sooooooo long since I’ve had any. Just sampled one without the powdered erithrytol cause I’m still waiting for them to cool enough, but they are FANTASTIC! The tast in these cookies is amazing, however, I left mine in the freezer for 30+ min, baked them and they spread out like nothing mattered? It’s an expensive recipe to find it doesnt work! Made these yummy morsels today. As a diabetic and someone trying to watch what they eat sugar is off the table. Using Swerve has changed all that. No flour and real sugar but these are amazing. My Fiancé is doing keto with me and asked me to find a recipie for these cookies. I FOUND IT. Thank you!! Another great recipe! I made the first batch on Saturday and turned right around and made another batch on Sunday. These are so delicious; I prefer them unpowdered, but I did powder some to share. 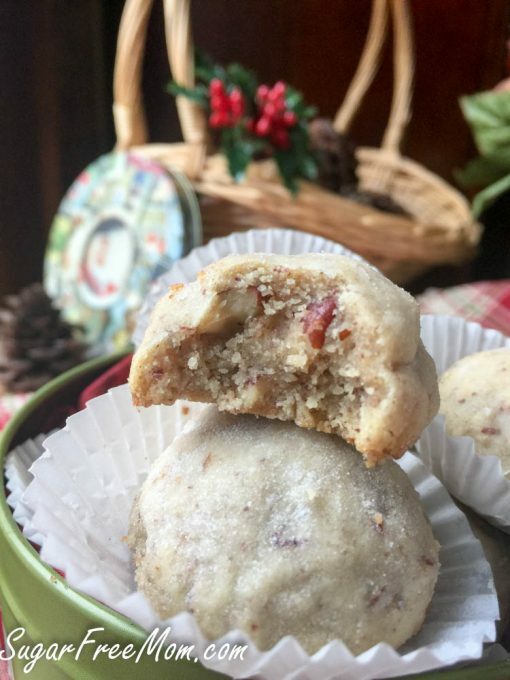 I love exposing my co-workers to great Keto treats- this one is coming to my cookie exchange in a couple weeks. I have not tried these yet, but I am fascinated with the use of gelatin for crispness, that is what keto cookies lack for me. Is there a particular ratio you use for the gelatin substitute? You don’t want to use gelatin in this cookie as you want a tender bite. 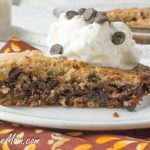 I use gelatin in my chocolate chip cookie as it gives an outer crispness and tender inside. These were fantastic! 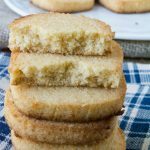 I’ve always loved to bake and now I’m so glad to have a Keto variation of a long time favorite cookie. They were easy with a few simple ingredients. 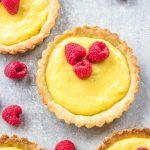 I’ve shared these with Keto and non-Keto eaters and everyone has loved them! This is my first use of Swerve and I’m suspecting there may be a little GI upset from it, but I’m okay with that, it will keep me from overindulging!